Hi, I’m Adventure Alan. Since 1999, this site has been dedicated to bringing you honest and factual information on gear and technique for backpackers and adventurers of all skill levels. The site content is concise and to the point, consolidating essential data in a few easily understood posts. The goal is to quickly enable the reader to find the information they need to fine tune their skill and gear to backpack in the most efficient and sensible manner. And yes, part of the focus of this site will be on adventure! Alan grew up in northern California and spent his formative mountaineering years in Yosemite and the Sierra Nevada. At age five, he carried his own backpack into the Yosemite backcountry. In the ensuing 50 years he’s climbed and adventured in North and South America, Europe and around the world. Somewhere in there he was part of the initial ultralight backpacking movement and co-founded Backpacking Light. He is a co-author of “Lightweight Backpacking and Camping: A Field Guide to Wilderness Equipment…,” as well as numerous reviews, and technical articles. A jack of all trades, Alan is a writer, photographer, outdoor guide, nationally competitive masters triathlete, and a national champion masters kayaker who also went to 2008 olympic trials in kayaking. Alan’s adventuring focus in the last 15 years has been his passions of mountaineering and canyoneering, but also pack-rafting in Alaska, Nordic skiing, and expedition kayaking. In the last few years Alan and his climbing/adventuring partner Don Wilson have setup and documented/published two new mountain high routes; The Southern Sierra High Route SoSHR, (an extension of the SHR to Mt Whitney and beyond), and the The Wind River High Route, WRHR. They intend to continue to explore, document and publish new mountaineering and canyoneering routes. Most folks go into the wilderness to enjoy the peace and serenity that comes from natural beauty and solitude of wilderness. They want to get away from houses, roads, and city life. To best do this, it makes sense to take the least amount and lightest of gear that will keep one warm, safe and comfortable. Lightweight Backpacking is perfect for following this ethic. 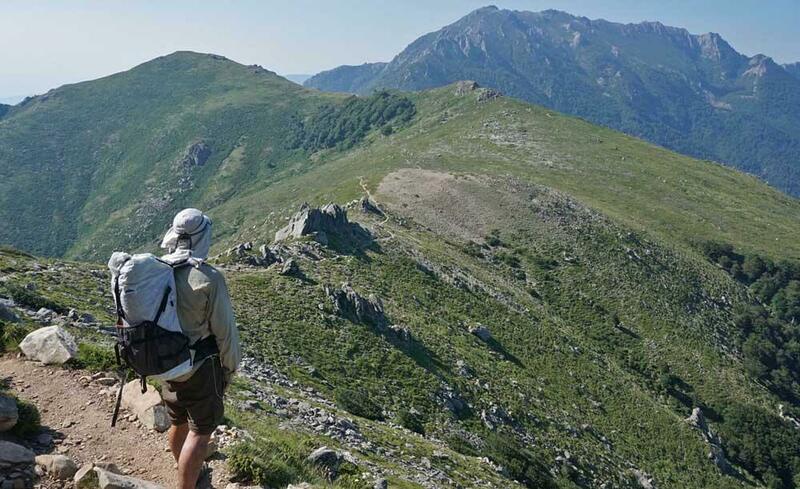 Moving fast and light along the spectacular ridge line of the GR20 in Corsica. A minimal pack (and good pre-trip training) enabled Alison and I to do a 16 day trip in under 8 days.